Intentional replantation is the intentional removal (extraction) and replantation of a tooth. This technique can be useful for teeth that cannot be treated with traditional endodontic surgery. This strategy can be particularly helpful in lower second molars where proximity to the mandibular nerve and thickness of the buccal bone make endodontic surgery difficult. This patient presented for treatment of tooth #18. It had previous endodontic treatment 15 years earlier. The patient presented with some intraoral swelling and intermittent pain that was worsened with pressure and biting. Class II mobility and deep buccal probing were found along with the obvious periapical radiolucency and apical resorption. 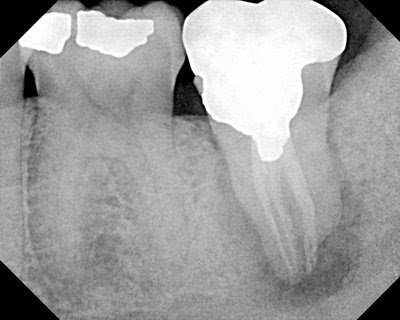 The tooth was diagnosed as: Prior RCT with chronic apical abscess. 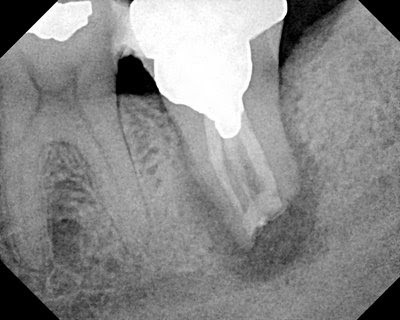 The large access cavity weakening the mesial tooth surface was noted and discussed as well as the possibility of a root fracture. Due to the conical root structure, closeness to the mandibular canal, and probable root fracture, we decided to perform and intentional replantation. Tooth was removed atraumatically and no root fractures were found. Immediate root resection, retropreparation and retrofill with MTA was performed. Patient was given PenVK 500mg for 5 days. Patient was informed of the guarded prognosis following this procedure. Long term follow up will be required to determine the success. 6 year recall of the patient finds the tooth completely functional and asymptomatic. While there are many who would not have considered saving this tooth, the intentional reimplantation procedure has saved this patient thousands of dollars and allowed him to retain his natural tooth. Reimplantation of an avulsed tooth is a well known and accepted treatment following a traumatic dental injury. Preservation of vital cells in the periodontal ligament allow reattachment of the tooth in the alveolar socket. Thanks for the post. 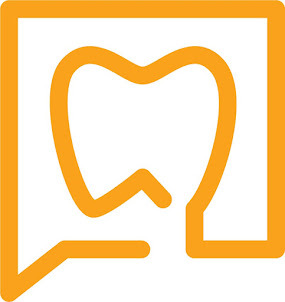 The tooth apex is close to the ID canal. Did you do any curettage for removal of some granulation tissues after the intentional extraction? Any splinting after re-implantation? If I did any curretage, it was only on the walls of the extraction socket. No splinting used in this case. Very good article with great images - thank you for sharing. Thank you for bringing up this its a hood subject to explore....Keep posting! May I ask as in this case, why flexible splinting (at least 7 days) is not indicated? I've done a few of these in my practicinglife some of which became ankylosed a one of which underwent resorption. I've applied it mostly on failed endo treatments either by myself or other dentists. It's possible to buy a minature vice in Germany to perform the extra oral apicectomy. It's a much quicker procedure extra orally and I usually splint the tooth with composite and fibre glass tape. I've never heard of this before. Thanks for the post. It was really interesting to read and learn about this new procedure I hadn't heard of. I may have to look into this more.